Family Owned Business Since 1992. Since 1992, Lasaii has assisted people in Structuring IRA’s, 401(k) rollovers, and other types of retirement plans to support the purchase of real estate. We have been engaged in this work for a long time. We have hundreds of clients across 36 states and four countries. The IRS Tax Shelter Inspectors reviewed the Lasaii IRA real estate investing program in 2005. Lasaii’s proprietary approach was found to be compliant relative to all 29 IRS tax codes governing tax avoidance, qualified plans, and/or real estate transactions. You can be confident that your investments are safe and legal. Alberto came to the U.S.A. from the Basque Country in 1968. To gain entry into the U.S., he worked as a sheepherder for three years. He could not speak a lick of English when he arrived. Alberto started selling insurance door to door in 1984. In 1986, he became as Series 7 Financial Advisor and did that for 17 years. In 1992, he created this proprietary approach of using IRA to invest in real estate that you can occupy. He has 40 years of experience in the financial world. Alberto enjoys hiking and traveling home to the Basque Country to visit his family and friends. 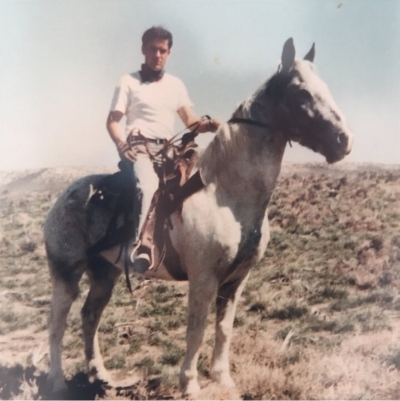 A young Alberto riding horseback in 1969 in the Sawtooth Mountains of Idaho. Xole graduated from Boise State University in 2013 with a BA in Spanish and a Minor in Basque Studies. Xole began working with her father at Lasaii Benefits upon graduation. She enjoys traveling and being active in her beautiful home of Sun Valley, ID. Lasaii Benefits. Trailing of the Sheep Festival sponsor in 2016.